A couple of things prompted this tweet tasting post, firstly I was going through some old notes and found this one that I had not yet posted (the tasting was almost a year ago). Secondly Teeling Whiskey is now available in South Africa and exclusively at WhiskyBrother, though only the Small Batch is currently available. And thirdly the Teeling Single Grain Whiskey was recently awarded the World’s Best Grain at the World Whiskies Awards for 2014. In 1782 Walter Teeling set up a craft distillery on Marrowbone Lane in the Liberties area of Dublin commencing a 230 year tradition of distilling for the Teeling family. The Teeling Whiskey Distillery is the first new distillery in Dublin in over 125 years and it is right back where they started in 1782 and only a stone’s throw away from where Walter Teeling’s old original distillery was. The new distillery will be open for visitors in 2015. The Teeling Single Grain was recently awarded the World’s Best Grain at the World Whiskies Awards, 2014. It is fully matured in Californian red wine (Cabernet Sauvignon) barrels with no chill filtration. Colour: Pale gold to corn gold with many medium legs. Nose: Warm spices (cinnamon) with sweetness in background that comes to the fore with time. Cereal and grains with a nuttiness that leads to lemon and a vanilla sweetness. It has a buttery creaminess to it, like a lemon sponge cake or lemon cheese cake. Also dark cherries with slight ruby grapefruit and a very subtle touch of smoke in back ground. Palate: Very sweet spiciness on first hit followed by fruit sweetness – berry fruits, red fruits and fruit pastilles. Vanilla again but a custard vanilla. Peppery, cinnamon, citrus, cranberry and strawberry yogurt. Smooth and creamy with some chocolateness around. Drying towards the end. Finish: Long and warm sweet spiciness with vanilla sweet fruit creaminess at end. #TeelingWhiskey our song pairing for Single Grain is “Desire” from U2 – it’s modern Dublin and whets the appetite for more whiskey!! This small batch bottling consists of hand selected casks which are given further maturation in ex-Flor de Cana Rum barrels with no chill filtration. Colour: Pale old gold with many medium legs. Nose: Clean with saltiness, rum & raisin chocolate, creamy spiciness and slight citrus notes (more oranges than lemons). Lovely winter spices (mostly cloves and nutmeg), salt & pepper mix, some malty grains and Red Heart rum. There are hints of tropical fruits (pineapple) with time. To round out, some cereal breakfast bar, slight burnt brown sugar, custard and banana. Not as sweet as the single grain. Palate: Sweet upfront spiciness, aniseed, vanilla and toffee. Slight woodiness, pepper, cinnamon, and some more of those warm winter spices (cloves and nutmeg), salty and with a dryness as well. Palate is very intense, creamy and rich with lovely oily mouth feel. Finish: Medium to long with sweet winter spiciness leading to a creamy end. #TeelingWhiskey Our music pairing for the Small Batch is Thin Lizzy Whiskey in the jar – rebel Dublin music to go with rebel whiskey !! #TeelingWhiskey our small batch is our take on producing the most interesting blended irish whiskey. This whisky contains some of the oldest Single Malt Irish whiskey ever bottled by the Teeling Whiskey Company. This Silver Reserve bottling consists of 21 Year Old Irish whiskey distilled in 1991 and matured firstly in Bourbon casks then allowed to marry in Sauterne wine casks (a first I believe for an Irish whiskey). Consisting of only hand selected casks chosen for their distinctive taste qualities this small batch bottling is limited to only 5,000 bottles. Nose: Waxy, earthy, mushroom farm, smoky (fragrant) and peaty. Has an old character to it. Dark dried fruits (apricots), mint, salty, nutty, liquorice, damp wood, grape fruit pastilles (the sugared kind) and tropical fruits there are some of the seemingly characteristic winter spices (mostly cloves) but not as strong as the previous two. Ending with hint of pear drops, sweet toffee apple, braaied bananas and an old leather couch. A powerful nose. Palate: Winter spice sweetness (cinnamon and ginger), wet antique wood, cedar, dark chocolate, dried fruits (predominately apricots) with a lovely smokiness. Slight braaied banana again, with liquorice, tropical fruits, honey & nuts and a sweet nuttiness. Palate is silky and smooth with an oily mouth feel, drying towards end. Richer and creamier than previous two whiskies. Finish: Very warm ‘heart’, with long and lingering winter spiciness that has a sweet smokiness at the very end. #TeelingWhiskey This is a very complex whiskey. When picking the casks I had to focus on the ones with a marzipan note in the middle. This Gold bottling of 26 Year Old Irish Single Malt is limited to only 1,000 bottles and comes from a handful of casks selected for their unique quality. Double distilled in 1987 and initially matured in bourbon barrels for 25 years this whiskey is given extra maturation in French white Burgundy wine casks for a further 12 months. Nose: Sweet and fresh as well as floral and fragrant. Rocky and pebbly beach with a fine sea spray over it. Marzipan, granny smith apples, waxiness, hints of creamy spiciness, pear drops, vanilla, fruit crumble, boiled sweets and lemons. Dark chocolate coated Turkish delight, black currant wine gums, ginger biscuits, fragrant wood and almonds. With time it gets sweeter, richer and creamier. The nose is delicate, elegant and very complex. Palate: Very smooth and drinkable with dark fruit pastilles/wine gums, sweet spiciness and sweet smokiness as well. There are berry fruits, strawberries, dried fruits, slight honey, some pencil shavings and strong but nice spiciness. Very oily and mouth coating. Palate is simply stunning and beautiful as well as light and delicate. Finish: Very long, lingering and changing. Sweet spiciness to a light creaminess at end. @TeelingWhiskeyC – #TeelingWhiskey the 26 YO is yet to hit the shelves and is not yet bottled. With release planned for 2014 you are getting sneak peek. @TeelingWhiskeyC – #TeelingWhiskey This whiskey started life in an AB and had just a little fruit in the nose and the finish was not strong. @TeelingWhiskeyC – #TeelingWhiskey So we put it in a White Burgundy cask to try and bring the ends together. @TeelingWhiskeyC – #TeelingWhiskey What we didn’t expect was the fruit explosion that the WB casks released in the nose and taste. @TeelingWhiskeyC – #TeelingWhiskey silky smooth tropical fruit punch or as Alex would say gummy bear milkshake!! A wonderful introduction the Teeling range and I am really excited to see if more of it will come to the sunny shores of South Africa (though all the rain and load shedding the past few weeks have made it decidedly less sunny). I enjoyed seeing how the different wood finishes, together with the various time in the barrel, created such different expressions, yet with some similar characteristics (like the winter spiciness for me). This I am sure will allow you to find one from the Teeling range that you would really enjoy. For me my favourite from the tasting was the Teeling Gold Reserve 26 Year Old 1987 Single Malt. Onwards with my reviews of 18 year old whisky and this time it is a short jump from Scotland to Ireland for my thoughts on the Jameson 18yo Limited Reserve. This whiskey is for at least 18 years in hand selected American bourbon barrels and European oak casks, and are finished in first fill bourbon barrels. The story of Jameson’s whiskey started on the 5th of October 1740 when John Jameson was born to a family whose motto, ‘Sine Metu’ (‘Without Fear’), was awarded to them for their bravery in battling pirates on the high seas in the 1500’s. When John Jameson acquired the Bow Street Distillery in 1780 it was producing about 30,000 gallons annually. By the turn of the 19th century, it was the second largest producer in Ireland and one of the largest in the world, producing 1,000,000 gallons annually. Dublin at the time was the centre of world whiskey production. It was the second most popular spirit in the world after rum and internationally Jameson had by 1805 become the world’s number one whiskey. Today, Jameson is the world’s third largest single-distillery whiskey. Originally one of the six main Dublin Whiskeys, Jameson is now distilled in Cork. In 2013, annual sales topped 4 million cases (48 million bottles). Colour: Deep gold (old to burnished) with many thick, long and slow legs. Nose: Black currant fruit pastilles, fruity – dark berries with more sweetness in the form of toffee, milk tart and toasted marshmallows. More tempered sweetness in some sweet and spicy wood with sweet spiciness (nutmeg) coming through as well. An absolutely beautiful and fragrant nose. Palate: Spicy fruity burst on tip of tongue followed by grape and black currant fruit pastilles and rounding out with some nuttiness. Some of that toffee and spiciness still around. Complex with a very smooth and mellow mouth feel that has a sweet lining of black currant. Finish: Fairly long with the spiciness and toffee sweetness that carries you to the spicy warm end. A fantastic finish, it is incredible going down. Overall: A very well rounded and fairly complex whiskey that is exceptionally smooth with a beautiful fragrant nose and palate that delivers lovely sweet spiciness and dark berry flavours. 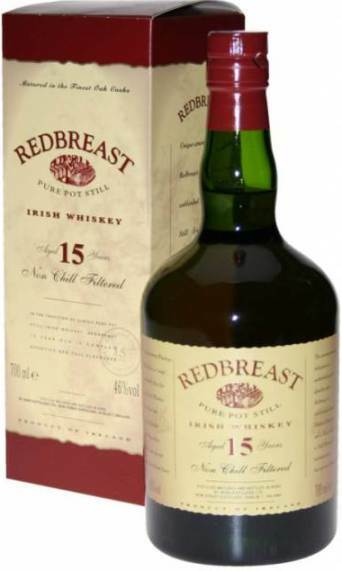 For my first Irish whiskey review I decided on one of my favourite Irish whiskey’s, the Redbreast 15 year old from New Midleton Distillery. It was matured in a combination of Spanish Oloroso sherry casks and American Bourbon whisky barrels. The whiskey was bottled at 46% ABV and was non chill filtered. In 2006 it was chosen by Jim Murray as the Whisky Bible ‘Irish Whiskey of the Year’. The Redbreast 15 year old is a pot still Irish whiskey. So what exactly is a pot still whiskey? According to the Single Pot Still website, it is a style of whiskey which is unique to Ireland (in general) and it is regarded as the quintessential style of Irish whiskey. It is made from a mash of malted and unmalted barley, which is then triple distilled in traditional copper pot stills. The inclusion of unmalted barley to the mashbill, along with the tradition of triple distillation, defines the character of Pot Still. The first official reference to the brand name ‘Redbreast’ appears in August 1912, when Gilbey’s were selling “Redbreast” J.J. Liqueur Whiskey 12 Years Old. The name ‘Redbreast’ itself refers to the bird, Robin Redbreast, and is attributed to the then Chairman of Gilbey’s, who was an avid bird-fancier. In December 1991, Redbreast was re-introduced by Irish Distillers Limited, after an absence of almost 10 years. In 2005 Redbreast 15 is released. Colour: Deep gold to burnished with long medium legs. Nose: Wonderfully complex, full and rich nose with a striking oiliness. Sweet wood notes and teasing nuttiness. Delightful sweetness to it, mostly in the form of mixed berries, black currant (fruit pastilles) and icing sugar. Also get some spicy hints on the nose. Palate: Full bodied and very nicely balanced, while also being rich with lots of full flavour. Very pleasant full mouth feel, oily and mouth coating, luxurious. Nice sweet spicy burn on tip of tongue (and back of mouth). The fruitiness I find coming through is tangerines, oranges and gooseberries. The spiciness is a hot and spicy woodiness while still being a sweet. Finish: Long and very spicy with enjoyable warmth at end. The spice stays on the tip of tongue for the whole ride. Also get a lovely sweetness in the finish, mostly burnt sugar and custard. Overall: A pleasingly full, rich and balanced whiskey with an interesting sweet and spicy flavour profile that still has a juicy fruitiness to it. A lovely introduction into the world of Irish whiskey.